Since its establishment in 1824, the Guénard oil mill has developed a unique expertise in both the selection of raw ingredients and production of artisan oils made from dried fruit and seeds of a very high quality. Over the years, our company has acquired a real expertise in selecting raw ingredients locally, nationally and even internationally. In particular, we have developed partnerships with the French producers of hemp, hazelnuts and walnuts in order to produce a line of 100% French virgin oils. Moreover, as has been the case since 1824, we gather a walnut harvest each year with the help of local harvesters, in order to develop our historical product: 100% virgin walnut oil. • Grinding : Usually, dried fruit and seeds are crushed using a granite millstone. This authentic artisanal process makes it possible to obtain a superior quality paste. • Roasting : This paste is heated in our cast iron pans or our cookers, which gives a delicately roasted character to our oils and accentuates the best flavors. • Pressing : In order to extract the 100% virgin oil, the paste is then pressed mechanically. • Refining : This last step produces a completely clear oil that is ready to consume. Since 1824, we have put our expertise into producing fine vegetable oils with distinctive flavors, solely for the satisfaction of our customers and gourmet oil enthusiasts. In fact, our desire is to provide fine products and consistent quality. To this end, a Quality Department associated with an analysis laboratory was established in 1996. Therefore, for any purchase of raw ingredients, we ensure that their level of quality is consistent with our requirements. All oils produced are checked in the same manner before being shipped. 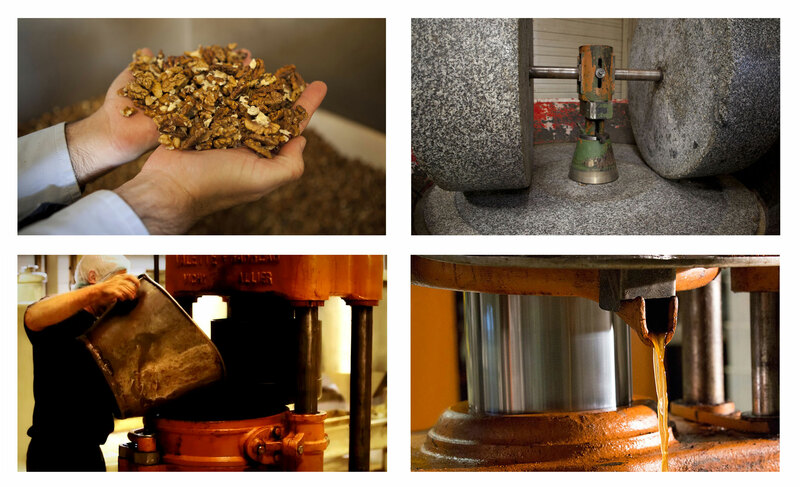 A sensory and clarity analysis is also performed on each batch to guarantee a consistent taste and high-quality oils. Our quality approach has been recognized since 2010 by achieving the IFS certification*, which must be renewed annually on the top level. We also offer an organic virgin walnut oil. This oil is labeled “Bio” (“Organic”) with the ECOCERT certification. *IFS (International Featured Standards): International certification issued by an independent body recognized by major food distributors. It is renewed every year at the end of an audit conducted by experts.